Finnish artist Toni Viholainen and his Nettless project triumphantly return to Earth Mantra, with the staggering two-disc collection of epic space music entitled Phobos and Deimos. To anyone who has heard his debut album From Beyond, also available here on Earth Mantra, it is obvious that Toni has a special talent for ambient music. So it was with great anticipation that we awaited his second release -- and the wait has been more than worth it. With more than two hours of music, the word "monumental" comes to mind when describing this album. This is a tightly focused assemblage of nothing but heavenly space music, a journey through the cosmos that strongly evokes the best you might hear from such folks as Jonn Serrie or Michael Stearns. Imagine a far future space craft journeying serenely through the most beautiful of planetary nebulae, silent and miniscule amongst the incredible grandeur of the dust clouds and stellar nurseries surrounding it. Now, with that picture in your mind, imagine this album as the soundtrack to such a journey. This is the kind of thing that we see when we close our eyes and listen to this music. Magnificent, glorious, lush, unapologetic space music. And glorious it is. If the straightforward beauty of the compositions themselves wasn't enough to love all by itself, the sound design and production is also immaculate, with perfectly selected timbres and effects filling the senses with what seems to us to be sheer ecstasy. There is carefully crafted detail everywhere in these pieces, from the vast stereo field, to the ebb and flow of light and dark, to the elegantly simple opulence of Toni's melodies. Ear candy of the highest order, to be sure, but also very satisfying from a compositional and active listening standpoint. Remarkable. We often suggest that our music is best enjoyed with headphones in a darkened room, and for this release it is particularly appropriate. Snuggle up in your recliner, fill up your glass with elixir, dim the lights, close your eyes, and prepare yourself for a tranquil journey through the measureless distances of our universe. What a tremendous experience. 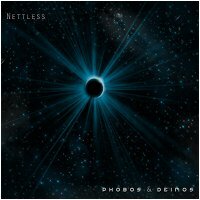 So it is our great privilege to bring to our listeners Phobos and Deimos, the sophomore release by Nettless. Surely one of the top pure ambient space music releases of 2010, and one we think our listeners will enjoy immensely. An album that really stands out. Very listenable high quality light and dark ambient. Nettless will definitely be staying on my radar. i really enjoy this genre of music driving in my car early in the morning before I am ready to face the hussle & bussle of the day and/or in the evening to ease down from the day. I have works such as Stece Roach's Immersion series. This will definitely be added to the mix. Perfect! Thanks!!! Mind-bogglingly marvelous space music that ranks with the very best of the genre. Destined to become a classic. been floating inside the phobos and deimos for the past few days.. surreal how the sounds are embedding themselves into my DNA.. epic in length and profound in it's interdimensional heights and abysses.. pure freedom dancing in the void. Thank you, Toni.